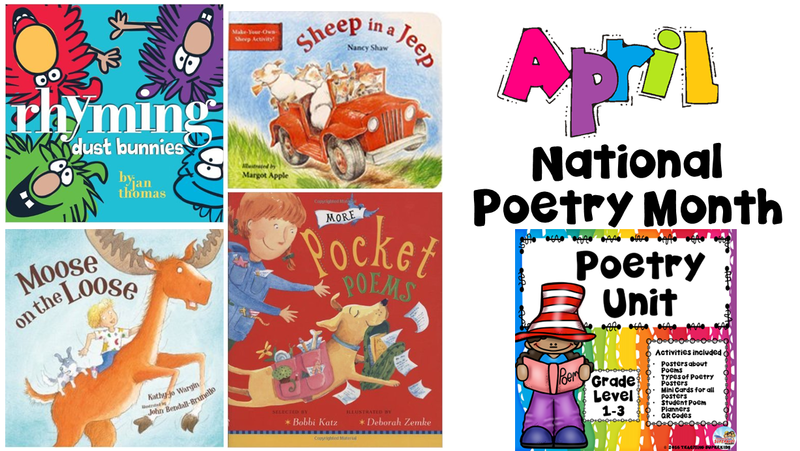 Using fun rhyming books to teach some of the different types of poetry can be an easy way to lessen the anxiety some kids can have when they being poetry lessons. By using poetry in the classroom you can help children with word knowledge, rhyming patterns as well as build fluency. There are so many awesome books and I wanted to share a few with you today! Bug! Rug! Mug! Hug! These dust bunnies love to rhyme. Well, except for Bob. Much to the other bunnies’ frustration, Bob can never get the rhythm right. Then he saves everyone from a big, scary monster wielding—gasp!—a broom, and they all breathe a sigh of relief. What would you do with a moose on the loose? Would you chase him, or race him, or stand up to face him? What would you do with a moose on the loose? What would you do with a moose in your yard? Or in your house? How about in your room? Or in your tub? Would you give him two boats? Would you see if he floats? Young Jeepers love silly adventures… and have we got a funny tale for you! This color children’s book “Sheep in a Jeep” by Nancy Shaw and illustrated by Margot Apple is sure to become your little one’s favorite read. With 26 pages of fun illustrations and Dr. Seuss-like rhymes you will find yourself reading the book out loud. At the back of the book there is an interactive family activity that will make this “Sheep in a Jeep” tale just that more memorable. Here is a fresh new collection of pocket-size poetry. This lively anthology is packed with kid-friendly poems, all eight lines or less, and features irresistibly playful artwork. Join the fun with such favorite poets as Eve Merriam, Jack Prelutsky, Langston Hughes, and Ogden Nash. Perfect to celebrate Poem-in-Your-Pocket Day. Another fun way you can introduce poetry this month is to create a station for the various types of Poetry. Post an anchor chart with an example and then add some books that follow that type of poetry. I created a set of Poetry Posters that include examples as well as QR Codes that correspond to each type of poetry. Kids love to use Tech and these QR Code examples are quick and to the point. The set also includes Poetry Planning pages for the students so they can create their very own poems. Don’t have room for different stations you can show the posters via the White Board and the QR Codes are clickable so you can show each one whole class if you need too.